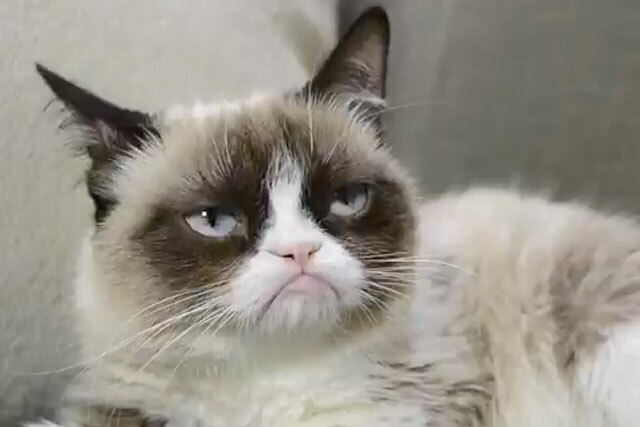 Grumpy Cat, the popular internet meme, has entered the viral chart for the first time this week in a Christmas ad for Friskies cat food. The ad, "it's hard to be a cat at Christmas", enters the chart in seventh place with 75,060 shares. YouTube's review of the year remains in the chart for a second week. Created in-house, the video adds 113,387 shares this week to bring its all-time total to 255,300. Following the emotive Christmas spot trend established by John Lewis, Apple's newly-released "misunderstood" by TBWA/Media Arts features a family brought to tears by a teenage relative's festive home video. The ad has been shared 123,649 times this week and sits in fifth place. But at the top of the chart for a second week, WestJet, the Canadian Airline, has been shared a further 505,260 times. The ad, created by Studio M, has been shared more than 800,000 times last week. The chart, collated and ranked by Unruly, ranks ads on YouTube by the number of shares across Facebook, Twitter and the blogosphere. Ads older than 30 days are not included. 7. Friskies "hard to be a cat at Christmas"
What is the top Christmas ad of 2013? What makes a special Christmas ad?